By corpus I mean a collection of texts. The texts can be of any kind, but I am interested in literature, so I’m interested in literary texts. What can we infer from a corpus of literary texts? In particular, what can we infer about history? Well, to some extent, it depends on the corpus, no? I’m interested in an answer which is fairly general in some ways, in other ways not. The best thing to do is to pick an example and go from there. The example I have in mind is the 3300 or so 19th century Anglophone novels that Matthew Jockers examined in Macroanalysis(2013 – so long ago, but it almost seems like yesterday). Of course, Jockers has already made plenty of inferences from that corpus. Let’s just accept them all more or less at face value. I’m after something different. I’m thinking about the nature of historical process. Jockers’ final study, the one about influence, tells us something about that process, more than Jockers seems to realize. I think it tells us that cultural evolution is a force in human history, but I don’t intend to make that argument here. Rather, my purpose is to argue that Jockers has created evidence that can be brought to bear on that kind of assertion. The purpose of this post is to indicate why I believe that. 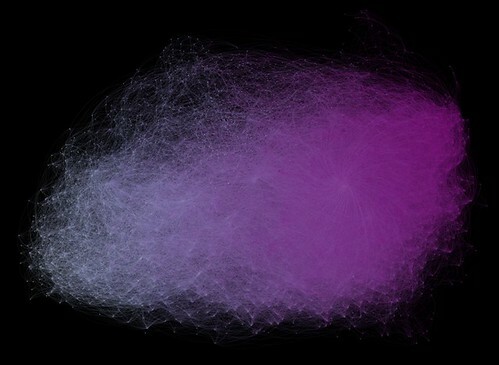 Each node in that graph represents a single novel. 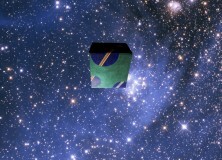 The image is a 2D projection of a roughly 600 dimensional space, one dimension for each of the 600 features Jockers has identified for each novel. The length of each edge is proportional to the distance between the two nodes. Jockers has eliminated all edges above a certain relatively small value (as I recall he doesn’t tell us the cut off point). Thus two nodes are connected only if they are relatively close to one another, where Jockers takes closeness to indicate that the author of the more recent novel was influenced by the author of more distant one. You may or may not find that to be a reasonable assumption, but let’s set it aside. What interests me is the fact that the novels in this are in rough temporal order, from 1800 at the left (gray) to 1900 at the right (purple). Where did that order come from? There were no dates in 600D description of each novel. As far as I can tell, that must be a product of the historical process that produced those texts. That process must therefore have a temporal direction. I’ve spent a fair amount of effort explicitly arguing that point , but don’t want to reprise that argument here. For the purposes of this piece, assume that that argument is at least a reasonable one to make. What is that direction? I don’t have a name for it, but that’s what the arrow in the image indicates. One might call it Progress, especially with Hegel looking over your shoulder. And I admit to a bias in favor of progress, though I have no use for the notion of some ultimate telostoward which history tends. But saying that direction is progress is a gesture without substantial intellectual content because it doesn’t engage with the terms in which that 600D space is constructed. What are those terms? Some of them are topics of the sort identified in topic analysis, e.g. American slavery, beauty and affection, dreams and thoughts, Greek and Egyptian gods, knaves rogues and asses, life history, machines and industry, misery and despair, scenes of natural beauty, and so on . Others are stylistic features, such as the frequency of specific words, e.g. the, heart, would, me, lady, which are the first five words in a list Jockers has in the “Style” chapter of Macroanalysis(p. 94). In a sense Hegel’s phenomenology is a study of phenomena (although this is not a realm he would contrast with that of noumena) and Hegel’s Phenomenology of Spirit is likewise to be regarded as a type of propaedeutic to philosophy rather than an exercise in or work of philosophy. It is meant to function as an induction or education of the reader to the standpoint of purely conceptual thought from which philosophy can be done. As such, its structure has been compared to that of a Bildungsroman (educational novel), having an abstractly conceived protagonist—the bearer of an evolving series of so-called shapes of consciousness or the inhabitant of a series of successive phenomenal worlds—whose progress and set-backs the reader follows and learns from. Or at least this is how the work sets out: in the later sections the earlier series of shapes of consciousness becomes replaced with what seem more like configurations of human social life, and the work comes to look more like an account of interlinked forms of social existence and thought within which participants in such forms of social life conceive of themselves and the world. Hegel constructs a series of such shapes that maps onto the history of western European civilization from the Greeks to his own time. Now, I am not proposing that Jockers’ has operationalized that conception, those “so-called shapes of consciousness”, in any way that could be used to buttress or refute Hegel’s philosophy of history – which, after all, posited a final end to history. But I am suggesting that can we reasonably interpret that image as depicting a (single) historical phenomenon, perhaps even something like an animating ‘force’, albeit one requiring a thoroughly material account. Whatever it is, it is as abstract as the Hegelian Geist. The most salient colors (black, white, and perhaps red) are named in all languages; the least salient of the set are named in fewer languages. Salience correlates with earliness of introduction. Consider this finding: “Salience correlates with earliness of introduction, as measured by a scale of social evolution”. What that means is that less complex societies (as measured by one of the standard indexes, Marsh’s socially complexity scale) have fewer basic color terms than more complex ones. Why? Back in the mid-1990s late David Hays reviewed and synthesized several decades of work on cultural complexity in non-literate societies. That review is now available on the web. At the time he died in 1995 my teacher, David G. Hays, The Measurement of Cultural Evolution in the Non-Literate World, had just completed a review and synthesis of cross-cultural work on cultural complexity. His widow, Janet Hays, undertook to publish the book in CD-ROM form. A couple months before she died last year Janet gave me permission to distribute the book in whatever way that seemed appropriate. Whether there can be a science of human life was a question in the air of the Center for Advanced Study in the Behavioral Sciences in 1954, where Raoul Naroll and I met. After forty years, the question has been answered only in part. In his last book, The Moral Order, Naroll began to sum up his life’s work on the human condition. That book convinced me, for the first time, that some of the findings of social science have the same kind of validity as findings in physics or biology. Naroll planned more books, but they will not be written. As a science, anthropology needs methods of measurement that can be applied across all cultures. Of the qualities of culture that need measurement, evolutionary variation stands out. Naroll had already begun work on his Index of Social Development when he came to the Center in 1954, and published it in 1956. Other scales were published in the next few years by anthropologists and sociologists. Nevertheless, some anthropologists still assert that evolution is unmeasurable. In ethnography, sociology, and archeology, the study of social and cultural evolution continues, and controversies abound. The welfare of groups within industrial countries, and the welfare of all the world outside the industrial sphere, depends on a clear understanding of evolution. The measurement of cultural evolution is an urgent practical matter as well as a necessity for theory builders. Naroll’s next book would have been called Painful Progress. That evolution is progressive was his credo, and he believed that he could justify that belief, as he wanted to justify all his beliefs, by presenting the right numbers in the right analytic framework. The history of humanity on Earth is full of pain, far more pain than historians generally admit in their books for general readers. Naroll believed that progress is the compensation we receive for the pain we cannot escape. Today the concept of progress is under attack. In other places, I offer an argument in support of Naroll’s position, but here I deal only in the technical issues of measurement. Whether there is progress, decline, or neither in cultural evolution may be argued, but only after accurate measurement reveals the facts. The story of cultural evolution is the story of human history, most of it unwritten; a full treatment of the subject is, roughly speaking, a complete textbook of anthropology. Naroll might have put a full treatment in Painful Progress, but that is not my intention here. The present book is a tract in methodology: What are the traits and variables that indicate the level of any culture? How can measures of individual qualities be combined into a single measure of cultural evolution? Answering these questions is the body of the present work. Although I was inspired by Naroll’s work, as was the whole field, I draw on a wide range of sources for concepts and data. In appendices, I review Naroll’s improvements in technique: How to determine the extent of a single “culture,” how to take into account the similarity of neighboring cultures, how to draw a sample of cultures, how to control for variations in the quality of the data that the anthropologist can draw on in making comparisons, and how to justify the inference of historical change from the study of groups known each only at a single date. Where others have gone beyond him, and where my views differ from his, I take note. Anthropology has been, mostly, the study of the non-literate world. In a long collaboration with William L. Benzon, I have written about the evolution of culture on up to the present day. We find qualitative differences that make it seem natural to me to limit the scope of this book to the customary scope of anthropology. Several of the sources that I draw on included in their samples such cultures as Athens and Rome, or Bulgarian peasants; even a few industrial cultures turn up. To deal properly with evolution after the invention of writing would require the introduction of additional variables; in the end, this is a book about the non-literate world. In Chapter 20, I show some of the deleterious effects of mingling literate and nonliterate cultures in the same study, as Naroll and others have done. The design of scales to measure cultural evolution in literate cultures remains a task for the future. The most important point to remember in the study of cultural evolution is perhaps this: That the evolution of culture is absolutely not predicated on the evolution of biological traits. The minds of culture bearers must certainly be different at different evolutionary levels, as they are different across cultures of the same level. But the brains of all humanity are biologically similar, as best we know, over all Earth and over 25,000 to 250,000 years. No racist conclusions can be drawn from cultural-evolutionary facts. Indeed, the methods of measurement that I describe here would be nonsensical if the variations observed were biological; human uniformity is the working premiss of the art. The principal contribution of this book is, I should suppose, the collection of profiles in Appendix F. In my judgment, these profiles are more informative than any of the scales on which they are constructed. 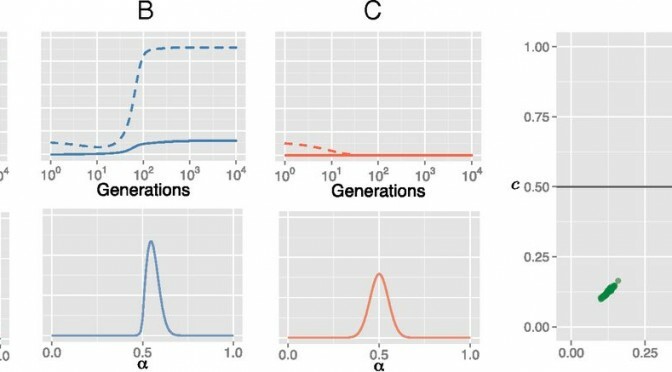 Research on the correlates of cultural evolution should be more valid if it uses these profiles to estimate the level of each unit (culture, society) studied. Students beginning to read about cultures other than their own can orient themselves by examining the profile of each culture they encounter: The general level, and the differences among such aspects as governance (the polity), social stratification (class), and expressive culture (religion), will help in the interpretation of ethnographic writings. In addition, methodological review demonstrates a number of shortcomings in prior work that require remedy. Some aspects of culture have been measured with adequate precision for some units, but no aspect has been measured adequately for all the units that will be drawn in future samples, and some aspects have not been measured adequately at all. Chapter 23 contains some suggestions. A new issue of the Journal of Language Evolution has just appeared, including a paper by Peeter Tinits, Jonas Nölle, and myself on the influence of usage context on the emergence of overspecification. (It has actually been published online already a couple of weeks ago, and an earlier version of it was included in last year’s Evolang proceedings.) Some of the volunteers who participated in our experiment have actually been recruited via Replicated Typo – thanks to everyone who helped us out! Without you, this study wouldn’t have been possible. I hope that I’ll find time to write a bit more about this paper in the near future, especially about its development, which might itself qualify as an interesting example of cultural evolution. Even though the paper just reports on a tiny experimental case study, adressing a fairly specific phenomenon, we discovered, in the process of writing, that each of the three authors had quite different ideas of how language works, which made the write-up process much more challenging than expected (but arguably also more interesting). This article investigates the influence of contextual pressures on the evolution of overspecification, i.e. the degree to which communicatively irrelevant meaning dimensions are specified, in an iterated learning setup. To this end, we combine two lines of research: In artificial language learning studies, it has been shown that (miniature) languages adapt to their contexts of use. In experimental pragmatics, it has been shown that referential overspecification in natural language is more likely to occur in contexts in which the communicatively relevant feature dimensions are harder to discern. We test whether similar functional pressures can promote the cumulative growth of referential overspecification in iterated artificial language learning. Participants were trained on an artificial language which they then used to refer to objects. The output of each participant was used as input for the next participant. The initial language was designed such that it did not show any overspecification, but it allowed for overspecification to emerge in 16 out of 32 usage contexts. Between conditions, we manipulated the referential context in which the target items appear, so that the relative visuospatial complexity of the scene would make the communicatively relevant feature dimensions more difficult to discern in one of them. The artificial languages became overspecified more quickly and to a significantly higher degree in this condition, indicating that the trend toward overspecification was stronger in these contexts, as suggested by experimental pragmatics research. These results add further support to the hypothesis that linguistic conventions can be partly determined by usage context and shows that experimental pragmatics can be fruitfully combined with artificial language learning to offer valuable insights into the mechanisms involved in the evolution of linguistic phenomena. In addition to our article, there’s also a number of other papers in the new JoLE issue that are well worth a read, including another Iterated Learning paper by Clay Beckner, Janet Pierrehumbert, and Jennifer Hay, who have conducted a follow-up on the seminal Kirby, Cornish & Smith (2008) study. Apart from presenting highly relevant findings, they also make some very interesting methodological points. Clarke argued that the world of wine glasses was different to the world of biology, where a simple binary key could lead to the identification of a living creature (Does it have a backbone? If so, it is a vertebrate. Is it warm blooded? If so, it is a mammal or bird. Does it produce milk? … and so on). A wine glass is a polythetic entity, which means that none of its attributes, without exception, is simultaneously sufficient and necessary for group membership. Most wine glasses are made of clear glass, with a stem and no handle, but there are flower vases with all these, so they are not definitionally-sufficient attributes; and a wine glass may have none of these attributes—they are not absolutely necessary. It is necessary that the wine glass be able to hold liquid and be of a shape and size suitable for drinking from, but this is also true of a teacup. If someone offered me a glass of wine, and then filled me a fine ceramic goblet, I would not complain. Asking at the outset whether an object is made of glass takes us down a different avenue from first asking if it has a stem, or if it is designed to hold liquid. The first lumps the majority of wine glasses with window panes; the second groups most of them with vases and table lamps; and the third puts them all into a super-category that includes breast implants and Lake Mead, the Hoover dam reservoir. None of the distinctions provides a useful classificatory starting point. So grouping artefacts according to a kind of biological taxonomy will not do. As a prehistoric archaeologist David Clarke knew this, and he also knew that he was continually bundling classes of artefacts into groups and sub-groups without knowing whether his classification would have been recognized emically, that is, in terms understandable to the people who created and used the artefacts. Although the answer is that probably they did have different functions, how might one work back from the purely formal, etic, variance—the measurable features or attributes of an artefact—to securely assign it to its proper category? What matters for proper classification are the attributes with “cultural salience” (Taylor’s term). Now cultural salience is how I define the genetic elements of culture, which I have taken to calling coordinators. Coordinators are the culturally salient properties of objects or processes. In a terminology originally promulgated by Kenneth Pike, they are emics (notice that Taylor uses this terminology as well). One thing that became clear to me in Dan Everett’s Dark Matter of the Mind (see my review in 3 Quarks Daily) is that a culture covers or paints (other terms of art I am considering) their natural environment with coordinators. Thus Everett talks about how, even after he’d been among the Pirahã for a couple years he simply could not see the jungle as well as they did. They were born and raised in it; he was not. Features of the jungle – creatures and events – that were obvious to the Pirahã because they had learned to identify them, that were culturally salient to the Pirahã, were invisible to Everett. They may have been right in front of his (lying) eyes, but he couldn’t discern them. They were not culturally salient to him, for his mind/brain had developed in a very different physical environment. The polythetic nature of cultural artfacts is closely related to what I have called abundance elsewhere. The phenomena of the world have many properties; they are abundant. Only some of those properties will even be perceptually available; after all, our ears cannot hear all sounds, our eyes cannot see all electromagnetic radiation, etc. Of the perceptually available properties, only some will be culturally salient. This is as true for natural objects as for cultural artifacts and activities. Consider these three words: gavagai, gabagaí, gabagool. If you’ve been binge watching episodes in the Star Trek franchise you might suspect them to be the equivalent of veni, vidi, vici, in the language of a space-faring race from the Gamma Quadrant. The truth, however, is even stranger. The first is a made-up word that is well-known in certain philosophical circles. The second is not quite a word, but is from Pirahã, the Amazonian language brought to our attention by ex-missionary turned linguist, Daniel Everett, and can be translated as “frustrated initiation,” which is how Everett characterized his first field trip among the Pirahã. The third names an Italian cold cut that is likely spelled “capicola” or “capocolla” when written out and has various pronunciations depending on the local language. In New York and New Jersey, Tony Soprano country, it’s “gabagool”. Everett discusses first two in his wide-ranging new book, Dark Matter of the Mind: The Culturally Articulated Unconscious (2016), which I review at 3 Quarks Daily. As for gabagool, good things come in threes, no? Why gavagai? Willard van Orman Quine coined the word for a thought experiment that points up the problem of word meaning. He broaches the issue by considering the problem of radical translation, “translation of the language of a hitherto untouched people” (Word and Object 1960, 28). He asks us to consider a “linguist who, unaided by an interpreter, is out to penetrate and translate a language hitherto unknown. All the objective data he has to go on are the forces that he sees impinging on the native’s surfaces and the observable behavior, focal and otherwise, of the native.” That is to say, he has no direct access to what is going on inside the native’s head, but utterances are available to him. Quine then asks us to imagine that “a rabbit scurries by, the native says ‘Gavagai’, and the linguist notes down the sentence ‘Rabbit’ (of ‘Lo, a rabbit’) as tentative translation, subject to testing in further cases” (p. 29). Quine goes on to argue that, in thus proposing that initial translation, the linguist is making illegitimate assumptions. He begins his argument by nothing that the native might, in fact, mean “white” or “animal” and later on offers more exotic possibilities, the sort of things only a philosopher would think of. Quine also notes that whatever gestures and utterances the native offers as the linguist attempts to clarify and verify will be subject to the same problem. I believe that the absence of these Quinean answers results from the fact that when one person points toward a thing, all people (that I have worked with, at least) assume that what is being asked is the name of the entire object. In fact, over the years, as I have conducted many “monolingual demonstrations,” I have never encountered the gavagai problem. Objects have a relative salience… This is perhaps the result of evolved perception. Frankly, I forget how I reacted to Quine’s thought experiment when I first read it as an undergraduate back in the 1960s. I probably found it a bit puzzling, and perhaps I even half-believed it. But that was a long time ago. When I read Everett’s comments on it I was not surprised to find that the gavagai problem doesn’t arise in the real world and find his suspected explanation, evolved perception, convincing. As one might expect, Everett devotes quite a bit of attention to recursion, with fascinating examples from Pirahã concerning evidentials, but I deliberately did not bring that up in my review. Why, given that everyone and their Aunt Sally seem to be all a-twitter about the issue, didn’t I discuss it? That’s why, I’m tired of it and think that, at this point, it’s a case of the tail wagging the dog. I understand well enough why it’s an important issue, but it’s time to move on. The important issue is to shift the focus of linguistic theory away from disembodied and decontextualized sentences and toward conversational interaction. That’s been going on for some time now and Everett has played a role in that shift. While the generative grammarians use merge as a term for syntactic recursion it could just as well be used to characterize how partners assimilate what they’re hearing with what they’re thinking. Perhaps that’s what syntax is for and why it arose, to make conversation more efficient–and I seem to think that Everett has a suggestion to that effect in his discussion of the role of gestures in linguistic interaction. Anyhow, if these and related matters interest you, read my review and read Everett’s book. Stephen G. Nichols, Mutable Stability, a Medieval Paradox: The Case of Le Roman de la Rose, Queste 23 (2016) 2, pp. 71-103. Yet even those who argue, to the contrary, that ‘transmission errors’ often represent creative ‘participation’ by a talented scribe, must recognize the attraction of a stable work.After all, despite an extraordinary record of innovation, invention, and discovery, the Middle Ages are an era that resisted change in and for itself. And yet this same veneration of conservative values underlies a fascinating paradox of medieval culture: its delicate and seemingly contradictory balance between stability, on the one hand, and transformation, on the other. It may be that only an era that saw no contradiction in promulgating an omnipotent, unchanging divinity, which was at the same time a dynamic principle of construction and transformation, could have managed the paradox of what I want to call ‘mutable stability’. Darwin’s ‘survival of the fittest’ is really a special case of a more general law of survival of the stable. The universe is populated by stable things. A stable thing is a collection of atoms that is permanent enough or common enough to deserve a name. It may be a unique collection of atoms, such as the Matterhorn, that lasts long enough to be worth naming. Or it may be a class of entities, such as rain drops, that come into existence at a sufficiently high rate to deserve a collective name, even if any one of them is short-lived. The things that we see around us, and which we think of as needing explanation–rocks, galaxies, ocean waves–are all, to a greater or lesser extent, stable patterns of atoms. In this case, however, it’s one that allows us to understand the paradox of medieval narrative forms whose ‘stability’ over time – in some cases over several centuries – depends on what I call the generative – or regenerative – force of transmission. Why ‘regenerative’ if transmission involves reproducing the ‘same’ work from one representation to another? The answer to that question involves recognizing the complex forces at play in the transmission of me- dieval texts, beginning with concepts like ‘the same’ and ‘seeing’ or ‘perspective’. After all, in a culture where the technology of transmission depends on copying each text by hand, what the scribe sees, or thinks she or he sees, must be factored into our definition of ‘sameness’ when comparing original and copy. This post is about terminology, but also about things – in particular, an abstract thing – and measurements of those things. The things and measurements arise in the study of cultural evolution. Let us start with a thing. What is this? If you are a regular reader here at New Savanna you might reply: Oh, that’s the whatchamacallit from Jocker’s Macroanalysis. Well, yes, it’s an illustration from Macroanalysis. But that’s not quite the answer I was looking for. But let’s call that answer a citation and set it aside. Let’s ask the same question, but of a different object: What’s this? 1. It’s a photo of the moon. Strictly speaking, the first is correct and the second is not. 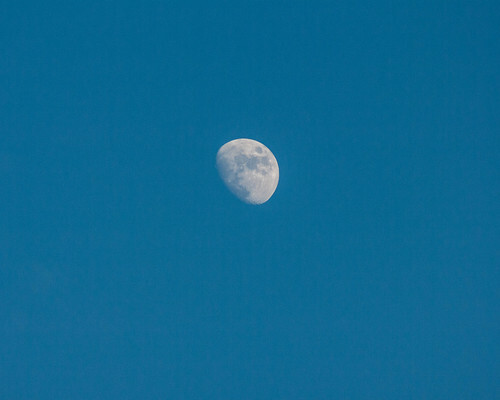 It IS a photograph, not the moon itself. But the second answer is well within standard usage. Notice that the photo does not depict the moon in full (whatever that might mean), no photograph could. That doesn’t change the fact that it is the moon that is depicted, not the sun, or Jupiter, or Alpha Centauri, or, for that matter, Mickey Mouse. We do not generally expect that representations of things should exhaust those things. 1. A representation of X. Let us start with X. Jockers was analyzing a corpus of roughly 3300 19th century Anglophone novels. To do that he evaluated each of them on each of 600 features. Since those evaluations can be expressed numerically Jockers was able to create a 600-dimensional space in which teach text occupies a single point. He then joined all those points representing texts that are relatively close to one another. Those texts are highly similar with respect to the 600 features that define the space. The result is a directed graph having 3300 nodes in 600 dimensions. So, perhaps we can say that X is a corpus similarity graph. However, we cannot see in 600 dimensions so there is no way we can directly examine that graph. It exists only as an abstract object in a computer. What we can do, and what Jockers did, is project a 600D object into two dimensions. That’s what we see in the image. A new paper, by Bill Thompson, Simon Kirby and Kenny Smith, has just appeared which contributes to everyone’s favourite debate. The paper uses agent-based Bayesian models that incorporate learning, culture and evolution to make the claim that weak cognitive biases are enough to create population-wide effects, making a strong nativist position untenable. The MPI for the Science of Human History is offering two grants for PhD students, starting 2016 (deadline for applications is March 21st, 2016). The Minds and Traditions research group (“the Mint”), an Independent Max Planck Research Group at the Max Planck Institute for the Science of Human History in Jena (Germany) is offering two grants for two doctoral projects focusing on “cognitive science and cultural evolution of visual culture and graphic codes“. Funding is available for four years (three years renewable twice for six months), starting in September 2016. The PhD students will be expected to take part in a research project devoted to the cognitive science and cultural evolution of graphic codes.